This name uses Manchu naming customs. The family name is Aisin Gioro. Dodo (Manchu: ; 2 April 1614 – 29 April 1649), formally known as Prince Yu, was a Manchu prince and military general of the early Qing dynasty. Dodo was born in the Manchu Aisin Gioro clan as the 15th son of Nurhaci, the founder of the Qing dynasty. His mother was Nurhaci's primary spouse Lady Abahai, who also bore Dodo's full brothers Ajige and Dorgon. A late-Qing woodblock print representing the Yangzhou massacre of May 1645. Dodo ordered this massacre to scare other southern Chinese cities into submission. 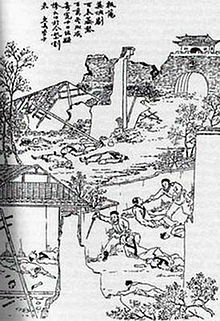 By the late nineteenth century the massacre was used by anti-Qing revolutionaries to arouse anti-Manchu sentiment among the Han Chinese population. In 1620, Dodo was conferred the title of a ejen. He became a beile at the age of 13 and was put in charge of the Plain White Banner, and started administrating affairs in the Ministry of Rites and Ministry of War. In 1628, Dodo followed Hong Taiji on the conquest of Chahar, Mongolia, and was granted the title of eerkechuhuer (額爾克楚虎爾) for his achievements. The following year, he followed Hong Taiji again on the conquest of the Ming dynasty, crossing the Great Wall and closing in on the Ming capital Beijing. In 1631, Dodo was involved in besieging the Ming army at Dalinghe. He lost his footing and fell from his horse during a battle and almost died at Jinzhou. The following year he participated in a campaign against Ligdan Khan of Chahar, and in 1635 he was appointed commander-in-chief for the first time at the Battle of Dalinghe. In 1636, Dodo was promoted to qinwang under the title "Prince Yu of the First Rank". He followed Hong Taiji on the campaign against the Joseon dynasty and defeated the enemy at Mount Nanhan. Two years later, he was demoted two grades to beile for bringing prostitutes with him in his army. In 1641, Dodo participated in the Battle of Songjin and led the Qing army in besieging Jinzhou in the first part of the battle. He led an ambush to wipe out the remnants of the enemy at Mount Song in the final battle and joined Hooge's forces in besieging Mount Song and captured the Ming general Hong Chengchou. He was promoted one grade to junwang for his achievement. In 1644, Dodo entered China proper after the Ming general Wu Sangui opened Shanhai Pass for the Qing armies. They defeated rebel forces under Li Zicheng at Shanhai Pass and occupied the Ming capital Beijing, after which Dodo was reinstated as a qinwang and appointed "Great General Who Pacifies the Nation" (定國大將軍). Together with Kong Youde and Geng Zhongming, Dodo led an army of 200,000, comprising both Manchu and Han Chinese soldiers, to attack the remnants of Li Zicheng's rebel army, defeating and driving the enemy from Henan to Shaanxi. In the first month of 1645, Dodo conquered Tong Pass and Xi'an, and in the second month he attacked the Southern Ming dynasty (remnants of the fallen Ming dynasty). In the fourth month, Dodo captured the city of Yangzhou and executed its defending official Shi Kefa, after which he ordered a massacre to be conducted. By the following month, Dodo's army had crossed the Yangtze River and occupied the Southern Ming capital Nanjing and captured the Southern Ming ruler, the Hongguang Emperor. In the sixth month, Dodo conquered Zhejiang and returned to Beijing, after which he received the title "Prince Deyu of the First Rank" (和碩德豫親王). In 1646, Dodo was appointed "Great General Who Spreads Might" (揚威大將軍) and emerged victorious from suppressing a rebellion by the Sonid Mongols. A year later, he was conferred the title "Uncle Who Assists in Governance and Prince Deyu of the First Rank" (輔政叔和碩德豫親王). Dodo died of smallpox in 1649 at the age of 36. Dodo was said to have a very close relationship with his brother Dorgon. Dorgon was attacking Jiang Xiang (姜瓖) in Shanxi when he heard that Dodo was severely ill, so he immediately turned and rushed back to Beijing, but when he arrived at Juyong Pass, he received news that Dodo had died. Dorgon was so grieved that he changed into plain robes and cried as he raced back to Beijing. In 1652, the Shunzhi Emperor posthumously demoted Dodo to the status of a junwang for his affiliation with Dorgon, whom the emperor perceived to have had the intention of usurping the throne. In 1671, during the reign of the Kangxi Emperor, Dodo was granted a posthumous name "Tong" (通), so his title became "Prince Yutong of the Second Rank" (多羅豫通郡王). In the first lunar month of 1778, the Qianlong Emperor posthumously restored Dodo to the status of a qinwang and created a place for Dodo in the Qing ancestral temple. Seven months later, a shrine was built for Dodo in the Mukden Palace. Ebrey, Patricia (1993). Chinese Civilization: A Sourcebook. Simon and Schuster. Struve, Lynn A. "Voices from the Ming-Qing Cataclysm: China in Tiger's Jaws. London: Yale University Press, 1993. Liu Xiaomeng. "Twelve Princes of the Qing Dynasty" 正說清朝十二王. Zhonghua Publishers, 2006. This page was last edited on 20 April 2019, at 08:51 (UTC).